Talk about kind of high-end watch is always interesting until it bring us like we are going to have them one really soon although actually we just have to write and make a review. Thus, which already feel usual with anything about watch with a very high price must know about Oris and Longines. These 2 luxury brands of watch have released hundred series of watch and seems like it never got wrong with all of them. By this chance, we are going to make one series of Oris and one series of Longines. We hope that you will enjoy the review about Oris Aquis and with the strong competitor comes from Longines Hydroconquest. 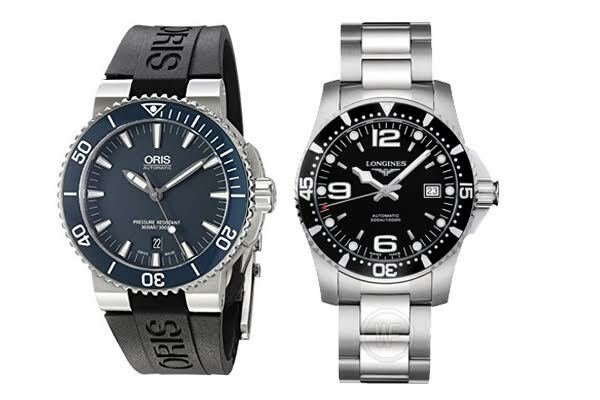 Then, the title will be Oris Aquis vs Longines Hydroconquest. Oris Aquis Date has a distinctive look, the black dial, and black uni-directional bezel. There is a black rubber strap that is screwed to the lugs and made a very solid impression to this watch. It is also featured with stainless steel folding clasp and it can be resized easily, so that for those who have a smaller wrist can have the strap cut on the right length for you. Always do this in little steps, as you don’t want to ruin the strap and you can still resize it in the clasp of course. The clasp also has a combination of a matt brushed finish and polished finish (Engraved). Oris Aquis Date is also again equipped with the popular red motor which is visible through the sapphire case back of the watch. The movement of this watch has been fitted with the famous red Oris rotor, a nice distinctive feature. Longines HydroConquest seems like one way to impress people and is handsome enough to go with a suit as well as with more casual clothing. It is features with 41 mm stainless steel case looks well and builts perfectly on your wrist and the quart version adds a 25 mm version to the HydroConquest collection as well. It has a case with a satin brush finish, the dial is super legible and Super Luminova for the indexes. It also has some arabic numerals and the wide silvered polished hands. All necessary functions are on the watch you could say. For those interested in a chronograph, there is good news, as there are also HydroConquest Chronograph versions. However, we decided to keep it under a €1000,- Euro and the chronograph version costs €500 Euro more. Both of them are having a very high quality and the design is almost alike to each other. As a daily wearer We would say and recommend the Longines hydroconquest edges out the Oris Aquis slightly. However the optional Oris rubber strap with quick adjust micro clasp is great that making this is one of a tough decision for us.